Throwing a football around has become a past time enjoyed by many people throughout the world. Whether you are in the back yard or at an NFL stadium there is nothing like tossing the "pigskin" with your buddy, son, brother, girlfriend or anyone for that matter. 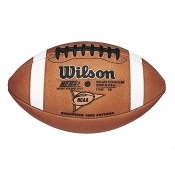 At Endzone Sports, we are your one stop shop for football and have every style Wilson Football available. 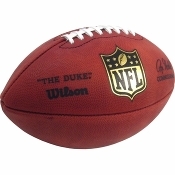 The Official Wilson NFL (The Duke) Game Football is available if you would like to throw around the exact same ball used by Peyton Manning and Tom Brady! If you are looking for NCAA College Footballs or High School Footballs we have exactly what you are looking for. 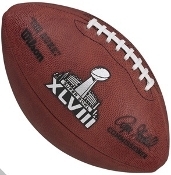 We have the same leather footballs that are used during games on friday and saturday throughout the country. 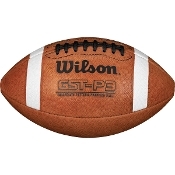 The GST 1003 Leather Football is the most popular among high schools and colleges but the Wilson 1205 Football and the Wilson 1005 are very popular sizes and styles that are frequently used. If you need a youth football, check out our great selection of K2 Footballs, TDY Footballs and TDJ Footballs that are fit for youth sized players. These footballs are sized specifically for certain youth aged players to allow them to properly grip and control the footballs. On top of the leather game footballs that we use, we also offer composite footballs that are the same size as the leather balls but are instead made of composite leather to make them more affordable and budget friendly. Composite Leather Footballs are popular among people who need a football to throw around at the beach or with their buddies in the street! 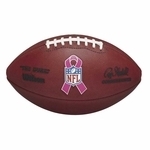 No matter what your need for a football is, we have them for the best prices you will find! As always, if you need help finding out which style suits your age of specific situaton feel free to contact us at (516) 409-2195. We are football experts and would love to help you with your football needs!